I started my craft blog about 18 days ago... When I started it, I kinda expected no one to look at it, but so far I have had just under 1100 views... EXCITING! It's fun to think that friends, family, and people I don't even know are looking at the things I make and ideas I have. One of my favorite things to do in my spare time is look at craft blogs so it is kinda fun starting up my own with hopes of inspiring someone to make something or try something new- like so many blogs have inspired me to do. So I made a hair accessory to give away... 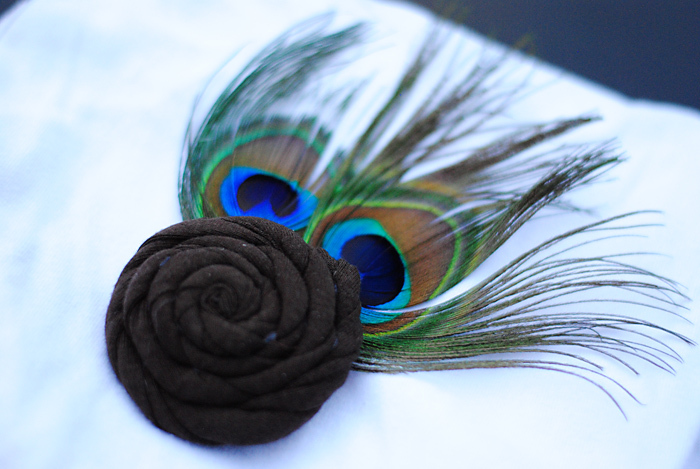 I am kinda digging feathers lately- especially peacock feathers so I fashioned a little feather bling for your hair! Anyone can enter my contest/ giveaway!!! 1. Become a follower of Mommy by day... Crafter by night. 2. Leave a comment telling me that you are a follower and why you should win this feathery hair thing to compliment your hairdo! 3. You have to live in the U.S. The contest will end in one week on Friday July 1st, 2011- So make sure you enter this week and I will announce the WINNER on this blog next weekend and then I will put the prize in the mail and get it to the winner! I needed a little somethin-somethin on my shelf and decided to make a smaller version of my floral arrangement and this is how it turned out... I just wanted something simple. It was super fast to make and cost less than $10 bucks total thanks to a sale at Hobby Lobby. Gotta love sales! This dress happened totally by accident. Or by me making a mistake I should say. 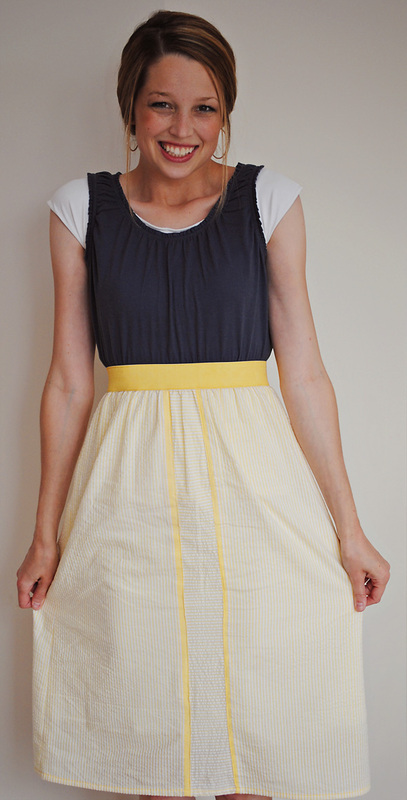 I had envisioned making a version of the dress I made last week but with light and breezy seer sucker fabric that would be nice and summery. So I got all my stuff to make it... $9 shirt from target, $3 yard of fabric (after the 50% off coupon) from Joann's, leftover dyed yellow elastic from last weeks dress and set out to make a pattern to cut out the skirt. So the front of the skirt ended up having a little more of a design than I had planned- but overall it turned out really cute! :) It was a mistake turned out for the better.... So all in all this dress cost less than 15 dollars to make... I got the necklace on clearance at Old Navy for less than $4 and the cute little sweater at Target to finish off my look for $17 (more than my whole dress cost, but I totally justified it since I know I can work it into lots of other outfits too) So there you have it... A dress of my own design. 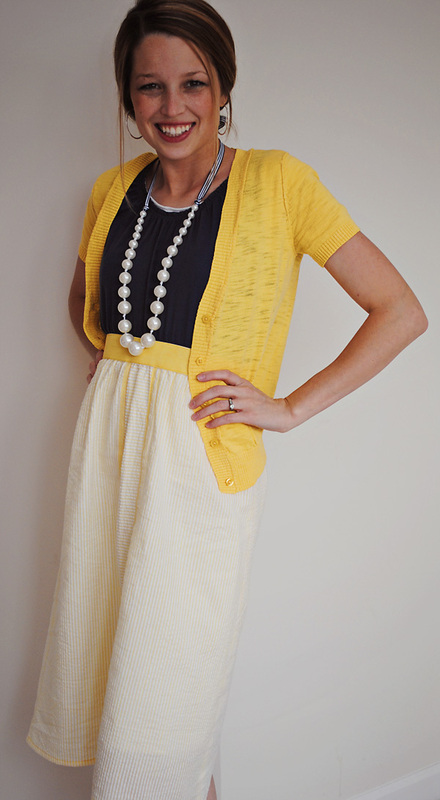 I think I will call it my Mellow Yellow Dress! I am jumping on the embroidery hoop bandwagon! 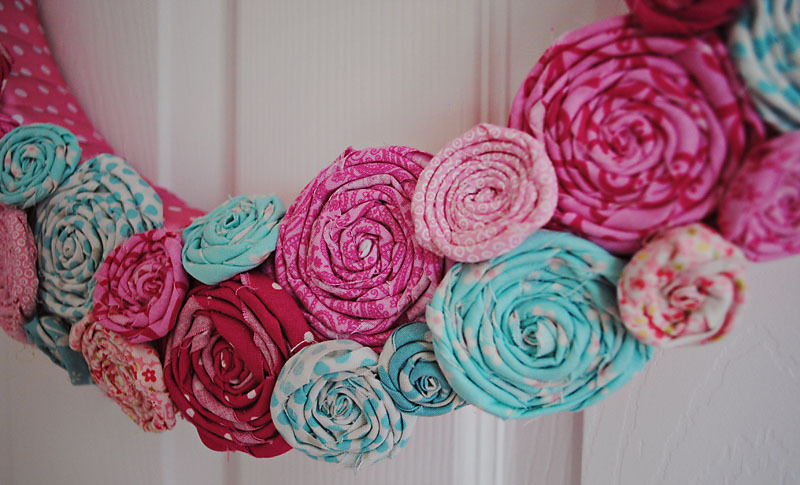 Has anyone noticed that embroidery hoops are becoming a popular item for decorating lately? It seems like every blog I look at is doing this... I love it! I got some hoops at Hobby Lobby and spent $9 on all of them together and used some fabric I had at home (including one of my shirts I stained dying fabric, an old baby blanket, and two old onsies that my girls had grown out of)... As I browse through fabric at the stores I may change out some of these fabrics for ones I love better, but for now this will do... Gotta love using things you have laying around the house and putting them to better use! P.S. This picture frame has a picture of my girls in it that I blacked out... Since my craft blog is public I don't want just anyone looking them- never can be too careful these days- Hope you understand! 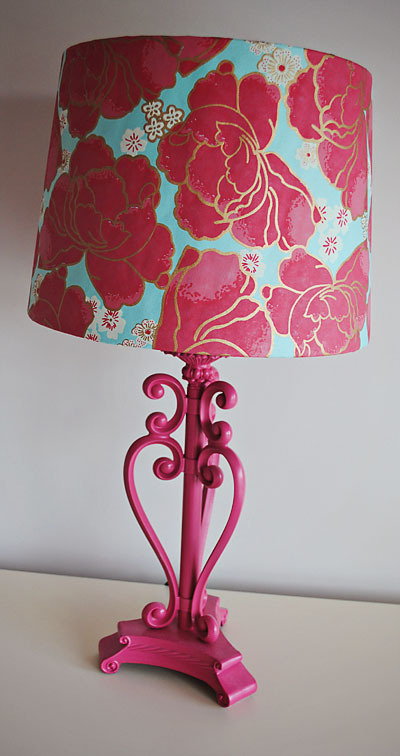 Making over a lamp is so easy and super inexpensive (two thumbs up!)... It's a great way to add a little umph to your room...you could use wrapping paper, news paper, fabric- pretty much anything! Throw in some spray paint and you are golden! I decided to make myself a dress.... I had to teach a lesson in relief society today (first time ever teaching in RS- a little nerve-racking) and I wanted something new to wear. I figured I would attempt to make my own! 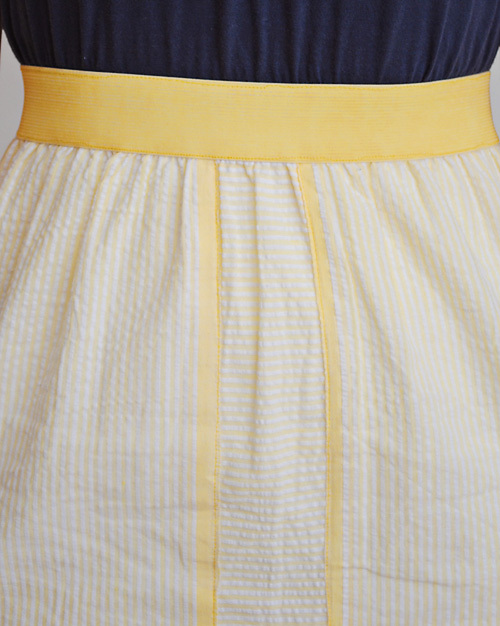 To make the dress it is just a t shirt cut off with a little elastic and some fabric for the skirt. 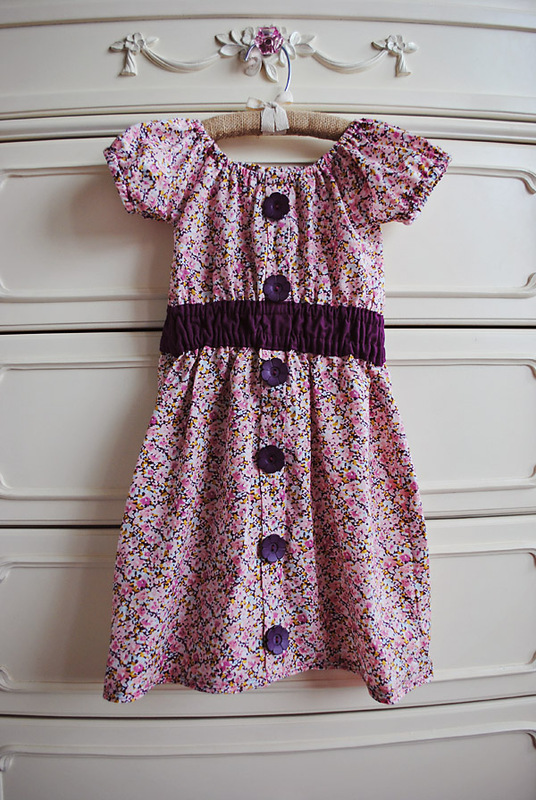 It was fairly simple and now that I know how to make this dress it just might be my go to dress... You can make it your own with different t-shirts (patterned or plain) and then fabric. I think if your shirt is patterned then the skirt looks better plain and visa versa... But it could turn out really cool to have both patterned fabrics if you had the right combination... The sky is the limit... The tutorial is here. Honestly- a week ago I had no intentions of making a craft blog. And there is a very big chance that no one will ever look at this thing, but I am doing it anyways. Reason #3. 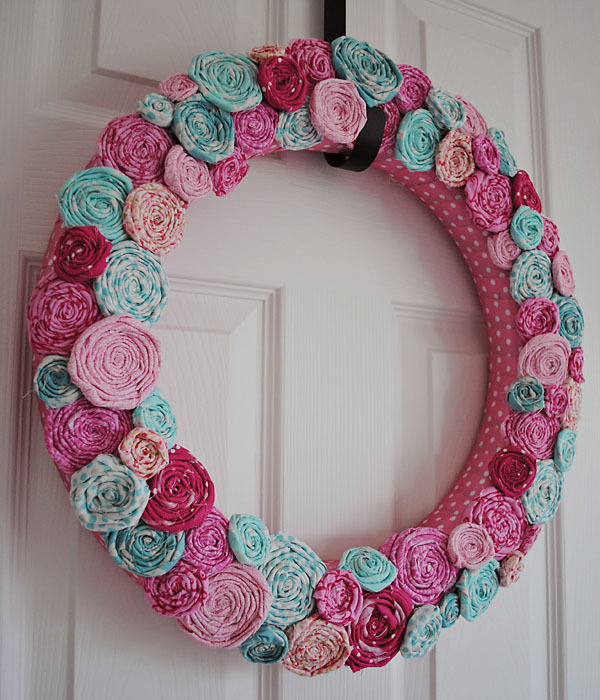 Gives me more motivation to learn new ways to be crafty and display the things I make. My ward has a craft group and we get together once month and craft, eat, talk, and laugh. Usually we talk so much that none of us ever finish our crafts! In April while I was home visiting family they made wreaths and I had them save mine for me to make once I got home. It was such a great idea and everyone's wreaths turned out so cute and so different even though we all used the same materials! Crafting together in a group is so fun because you are able to see each other's ideas as you make your own- plus it is SO FUN! It's one of my favorite things each month! I was introduced to rolled flowers about two months ago and now I can't get enough of them! 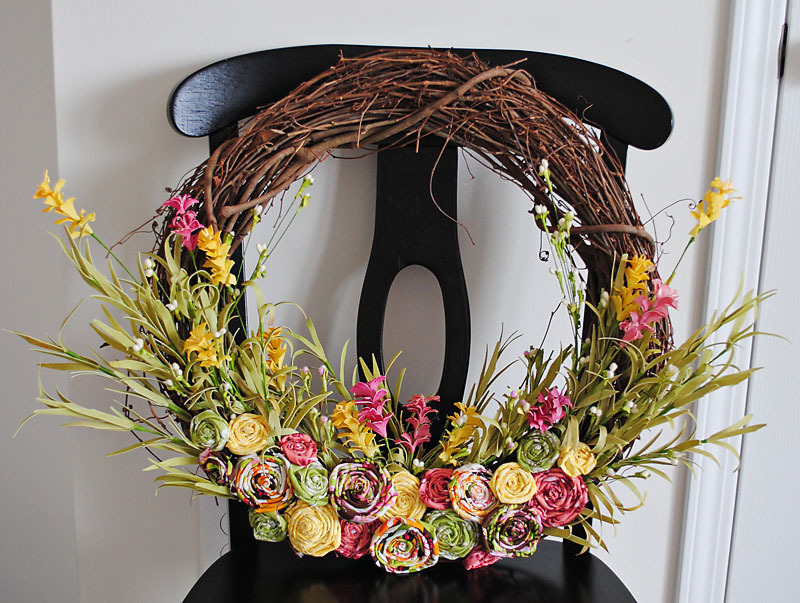 I love them and decided to make an entire wreath out of them... Not a quick venture in the least! I watched half a season of 24 on netflix while I worked on this puppy! Each night when my girls went to bed I worked on it for an hour or two and slowly but surely it came along... Here is the finished product! I was looking at the K.I.S.S. blog a while ago and there was the cutest idea that I had never though about doing before. 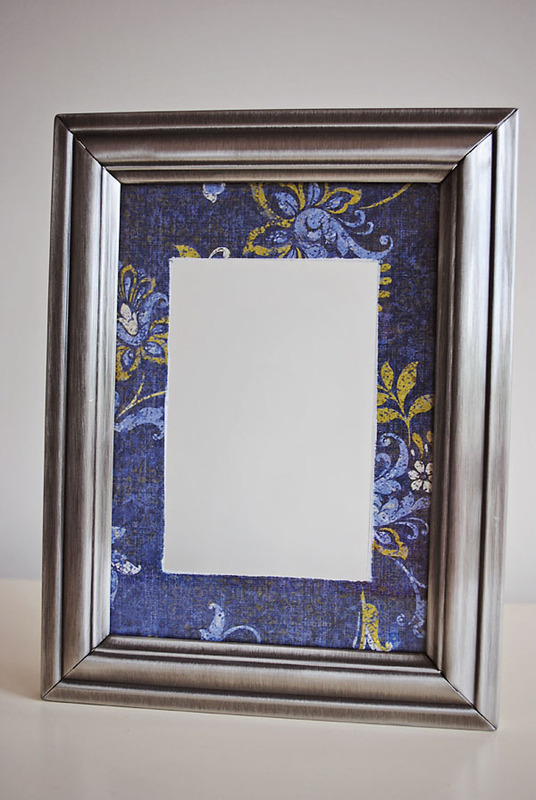 She had taken the mats out of the picture frames and applied scrapbook paper to them to give the frames a little color and pizazz! I loved the idea! I am constantly thinking that I love to look of a mat inside a frame but I am not always loving the colors they come in or how they look with the actual frame itself. This fixes all those issues I once had! 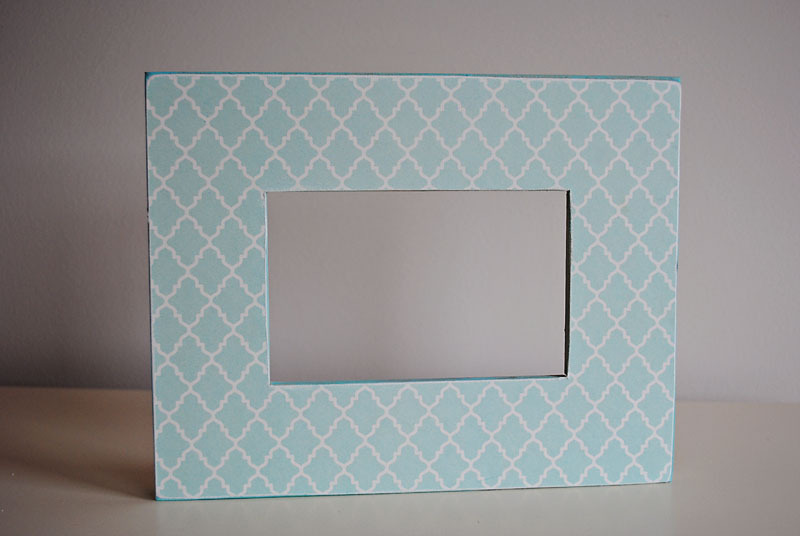 This blue frame is honestly just a $5 frame from the bargain frames at Walmart- spray painted. 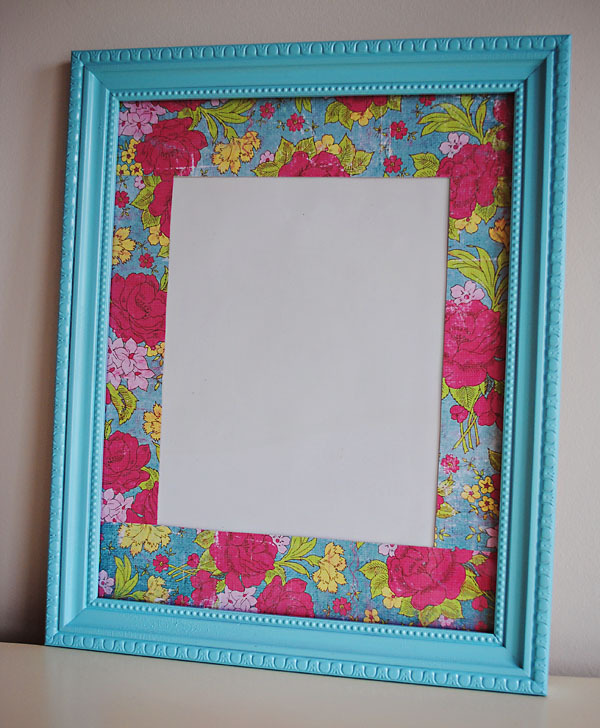 I love the way the paper adds a slash of color to what may be a boring or just plain frame! 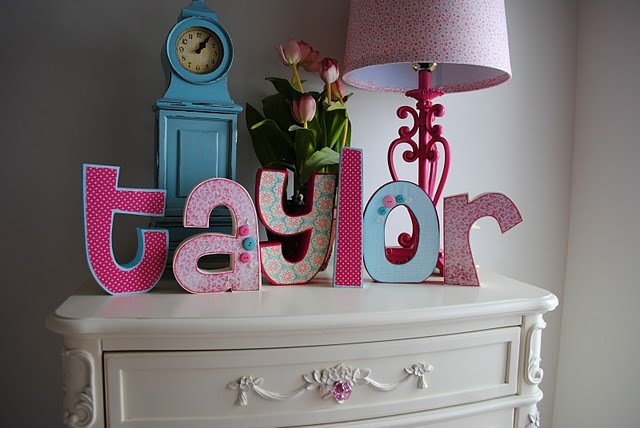 I started by tracing them both on scrapbook paper that coordinated with the decor in my girls room and then cut it out then applied it too the bare wood with a very thin layer of hodgepodge. 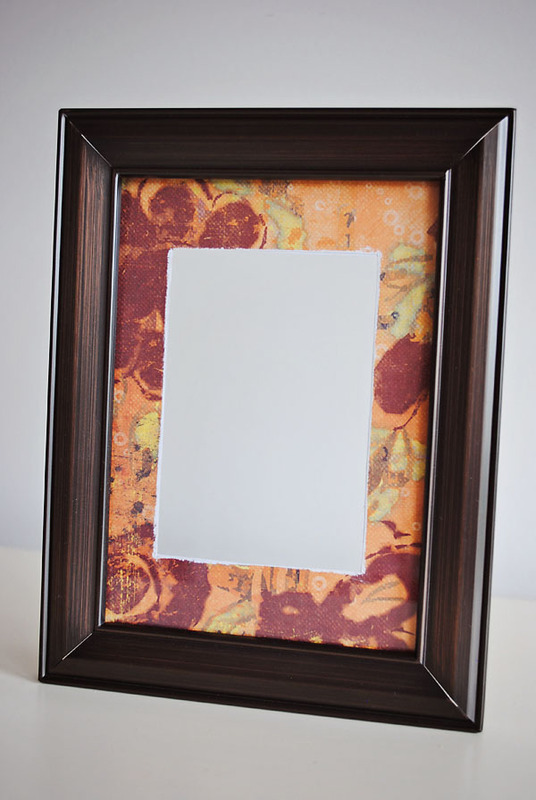 When you do this I have found that a thin layer works best and try to smooth it as you go so you don't get any air bubbles trapped between the paper and the wood. Let it dry for a bit. 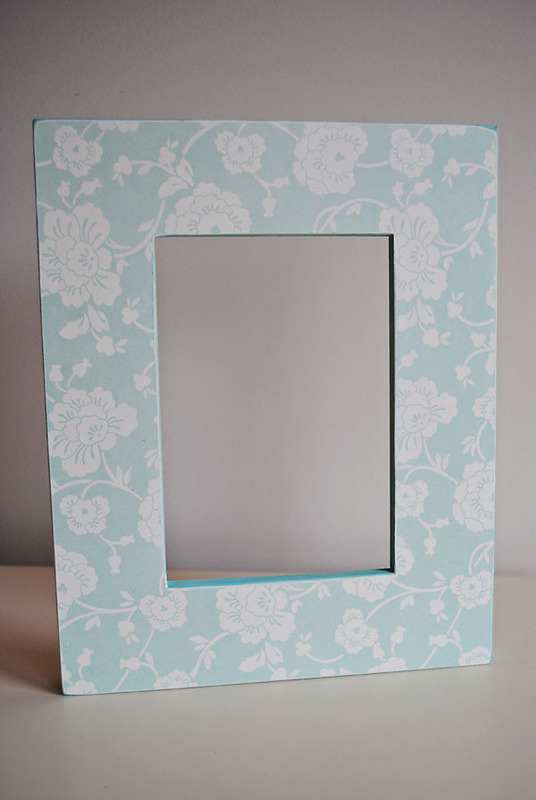 Then I sanded the edges of the frames so that the paper that hung over the a tiny bit got sanded off and the edges started to look a little worn. To finish them all off I just used an ink pad from my scrapbooking supplies and inked around all the sides of the frame and then wiped off all the access ink after I was all done- I used the ink instead of paint because I wanted the wood grain to show through it- plus it was super easy and now paintbrush to clean out afterwards! And voilà they were done! 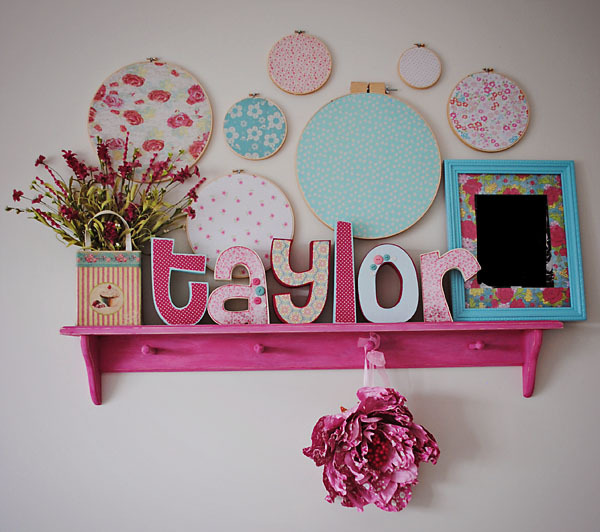 I have wanted to find a pink shelf for my girls bedroom for almost a year now. I searched etsy, all over the internet, you name it- I looked there. 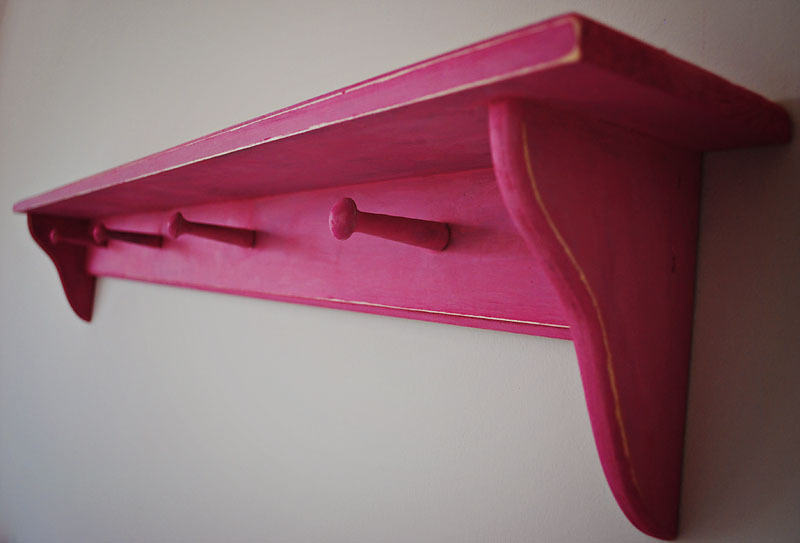 I found lots of really cute pink shelves but they were SUPER expensive and of course I always thought the very most expensive ones were the cutest! I ended up buying one that I thought was darling and was only $25! Those of you who read my family blog know how good that went... Basically in a nut shell it was pretty tiny and not quite what I was looking for and once I got it and saw how tiny it was I realized why it was only $25. So about a month ago I got a 50% off coupon for Hobby Lobby and headed there in search of an unfinished shelf I could paint myself. 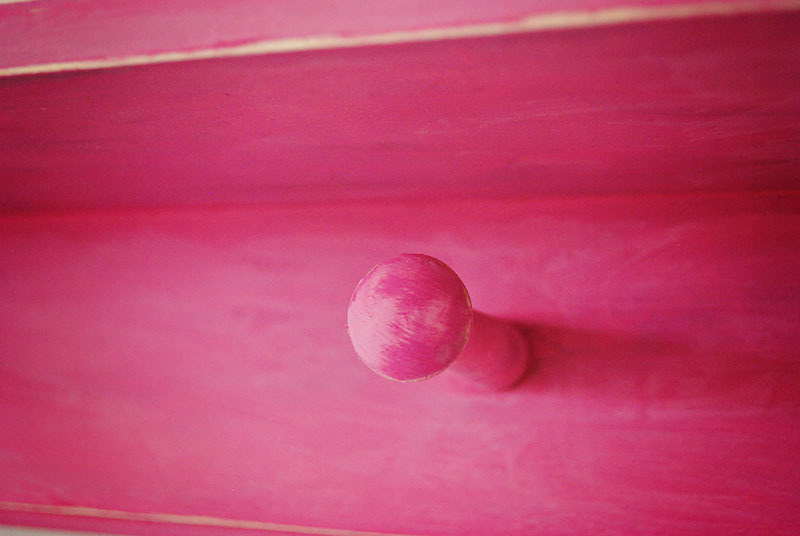 I started by paining it pink and had just planned on sanding off the edges to rough it up a bit but it wasn't quite the look I was hoping for. So I added some watered down charcoal gray, some watered down antique white by applying it all over and then wiping it off with a rag. Then I finished it off by painting the whole thing with a watered down lighter pink than the first coat of pink (but I didn't wipe it off). After it was all dry I sanded the edges and roughed it up a little. You are probably wondered why I went through that whole process when overall it looks pretty much just plain pink right??? ha ha Good question. 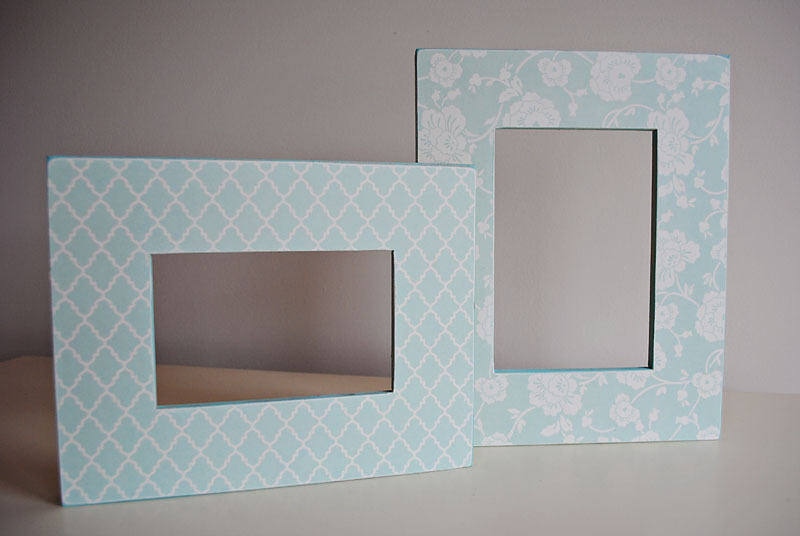 Painting wood projects like this is super easy and fairly inexpensive. It is hard to screw up because if something doesn't look how you want it to- you just paint over it! I pretty much love all things nautical. I secretly wish I lived in a beach house on the beach surrounded by navy and white striped decor, anchors, and sand. Yep- sounds heavenly! Sadly it's not in the cards for me at this time, but one step into my guest bathroom and I swear I can smell the ocean breeze... ok not really, but a girl can wish a little right? 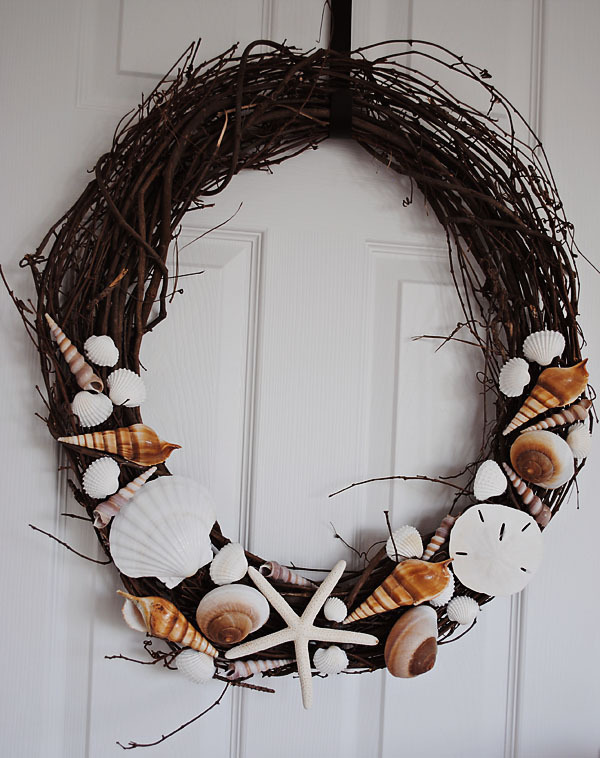 I wanted to come up with a wreath that was different, and I am sure that I am not the first to hot glue sea shells to a wreath, but here is my attempt at a nautical feeling wreath. I love it. Plus it cost me about $15 to make. Not too shabby. The only thing that would make it better was if I picked those shells up out of the sand myself! Thankfully Hobby Lobby had me covered there! 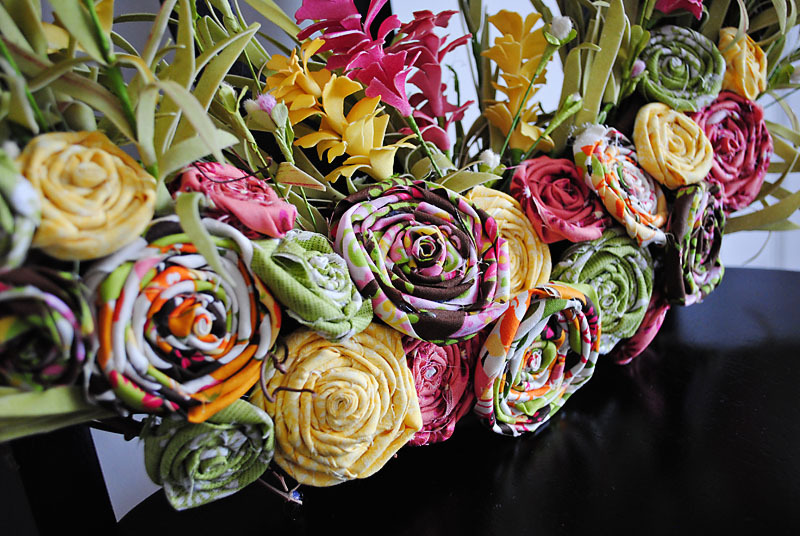 I have always wanted to make my own floral arrangement, but never have due to the fact that I didn't know what in the heck I was doing. On a whim at Hobby Lobby the idea came back and I decided once and for all I was going to do it. 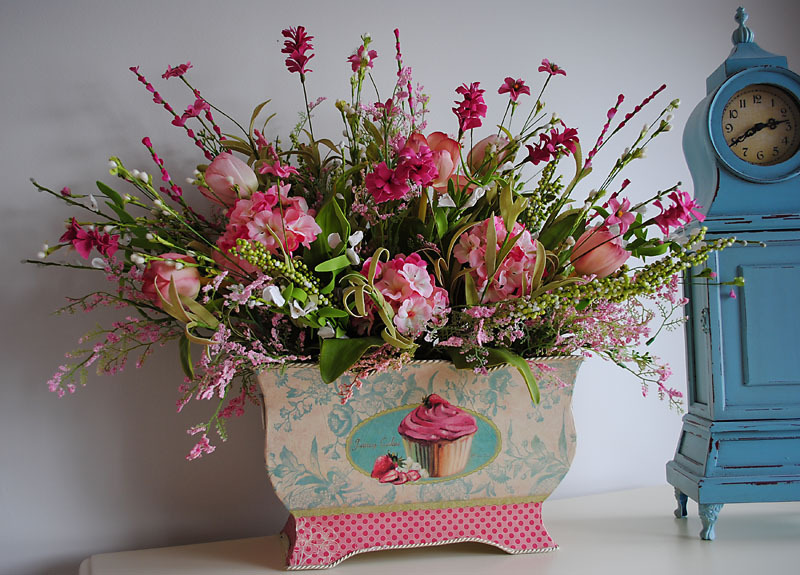 After staring at the tin on my kitchen table for about 5 minutes wondering where in the world to even start, I delved in and just started putting flowers places (and taking them out again when it didn't look perfect) and after about and hour I came up with this. One thing that is great about making your own arrangement is that you can control the colors and flowers you put in it! So the options are endless! I have always thought sewing was just one of those things that I would NEVER do. It seemed so tricky and way out of my league! And a lot of it stills seems that way, but slowly, little by little I am learning to make things and I am having fun while I am at it. I have to undo just about as many lines as I actually sew, but so far I haven't given up yet. 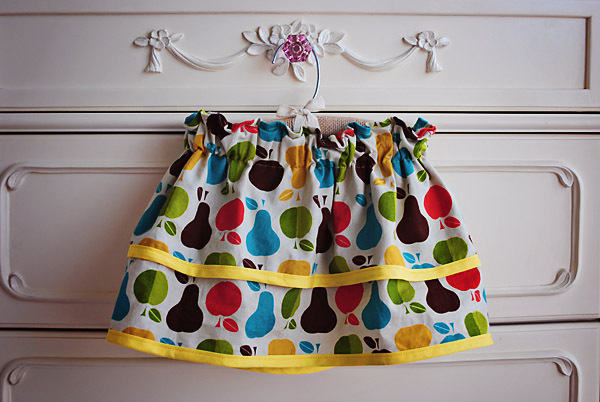 I honestly started thinking about learning to sew when I stumbled upon a sweet sewing blog. It's called Made. It is seriously so awesome! I love it! The girl who makes all the stuff had tutorials that teach you step by step what to do and I have used two of her tutorials to make things for my girls. 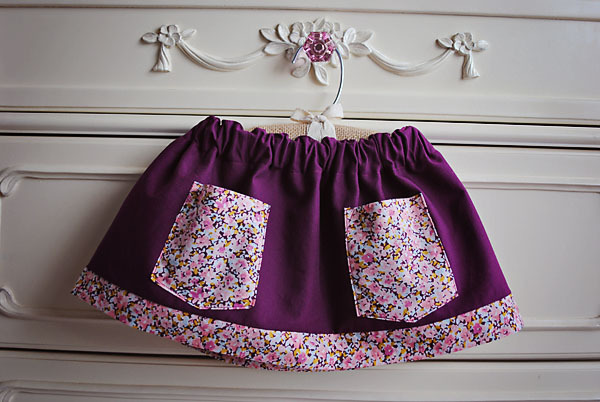 If you want to learn to sew or you know how to sew already and you want to try something new check out her blog. I highly recommend it! The thing that I like the most about learning to sew the way she does is that she makes her own patterns- something that is becoming more and more popular to do. 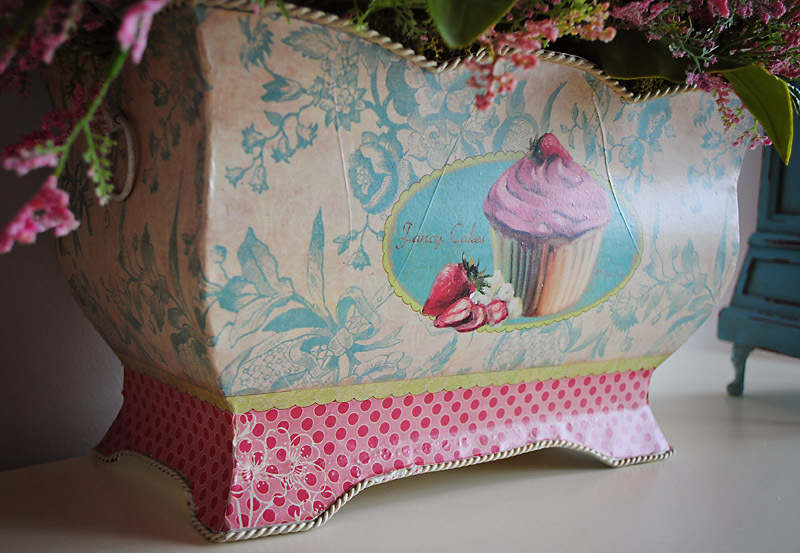 There are so many great blogs out there with free tutorials that teach you how to make such cute stuff. I might just be becoming a little bit addicted to looking at them all! 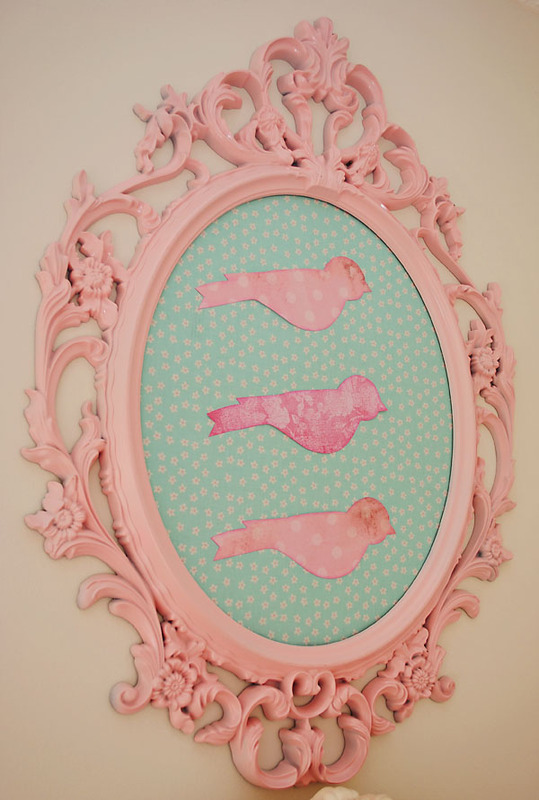 I love birds in decor. I think they are earthy, fresh, and just cute!